The first hut, Grimsfjall I, the measurement equipment installation, and the geothermal power station were built in 1957. 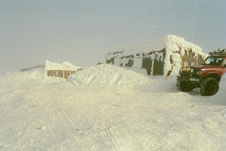 The hut, Grimsfjall II, was built in 1987, and the fuel storage house and the latrine were built in 1994. The older hut accommodates ? people and the younger 24. The houses are located 1,724 metres above mean sea level. They are within the boundaries of National Park Skaftafell. Houses I and II are locked, but those who make prior arrangements, usually are granted access. Contact Mr. Vilhjalmur Kjartansson, Tel. : 893-0742. GPS co-ordinates: 64° 24.410' 17° 15.966'.